A model can consist of several model layers, eg, Payment and real flows. 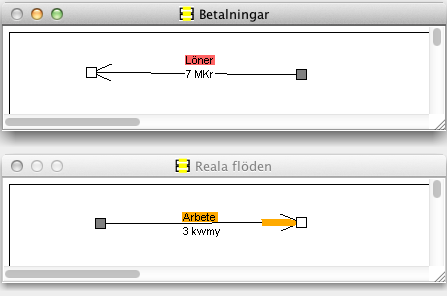 In each model layer is used only certain varieties (units) of input flows. The layer of payments may have flows that are measured in variety crowns or dollars. In models with multiple currencies needed one layer for each currency. Layer for real flows may have flows that are measured in man-years worked and produced man-years. Population is measured in number of persons, energy kWh and mass kilogram. All varieties can be selected with the prefix k = kilo = thousand, M = mega = millions, G = giga = billion. Model with two layers, one for payments with the variety million (mega dollars) and another one with real flows, labor, with the variety kwmy (thousands of man-years worked). Model layers are handled in the menu Layers … with the Meyer. Add Layer … adds a layer of the model. The windows of the layers can be arranged with the menu View -> Tile Vertical or Horizontal Tile. Edit Layer … opens a dialog box to name the layer mm. Delete Layer takes live the last active (selected) layer. Type a new name for the layer, such payments in the Name box:. 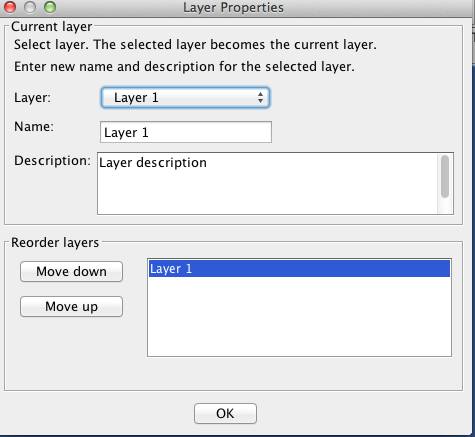 If you have multiple layers so you can change the order of the box Reorder layers.